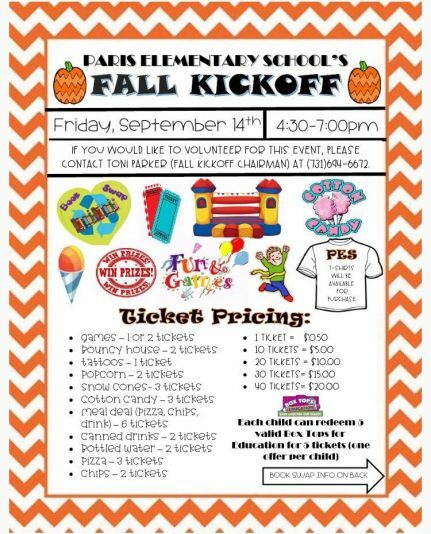 Paris, Tenn.–The Paris Elementary School’s annual Fall Kickoff celebration is Friday, September 14, and they’ve added something new to the event: Kids can throw a pie at an administrator or teacher during the festivities. Potential targets are Principal Chip Gray, Coach Cate, Mr. Lassiter, Ms. Amelia or Ms. Luffman. $5 and you get to choose! The school will be all decorated for Fall and will include bouncers, snow cones, corn hole, putt putt, ga-ga, pizza, cotton candy and more. And there are plenty of photo opportunities between parents and their kids. The event begins at 4:30 p.m. and ends at 7 p.m.